Let’s not beat around the bush. Lexus totally missed the boat on having a 3-row crossover vehicle (apart from the truck-based GX and LX SUVs). 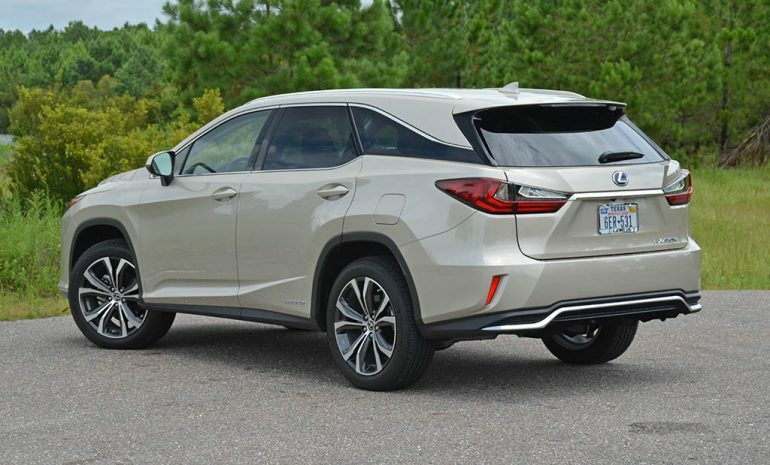 For as long as luxury 3-row crossovers have been the go-to in the fruitful and multiplying suburbs of America, Lexus continually failed to deliver on something to compete with the likings of car-based crossovers like the Infiniti QX60 (previously the JX), Acura MDX, Audi Q7, and even the GMC Acadia. 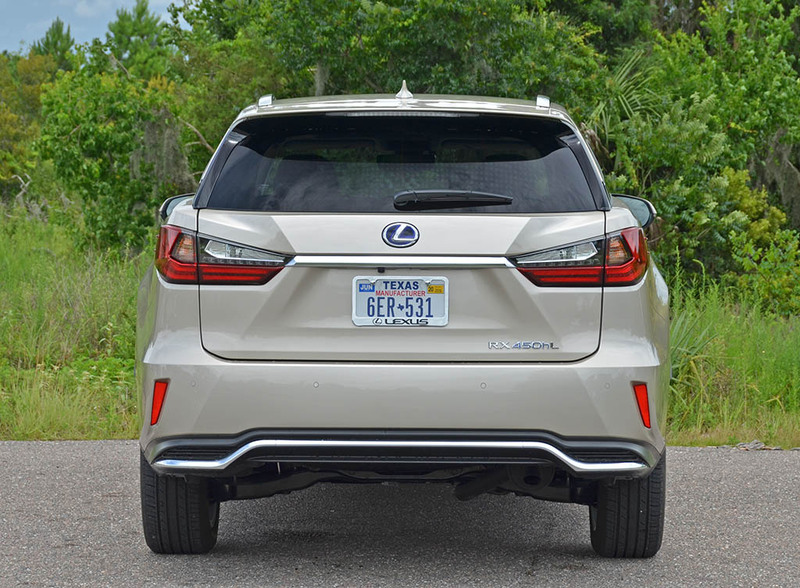 While the Lexus RX continued to bring in record sales as the popularity of crossover utility vehicles naturally grew, the 5-passenger RX couldn’t compete with other luxury 3-row crossovers to seat upwards of 6 and 7 passengers – until now. 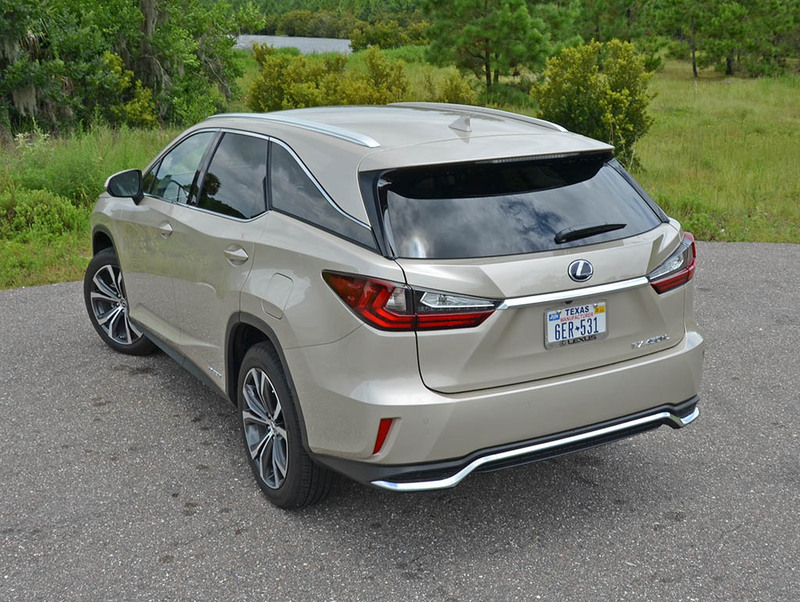 In comes the Lexus RX L, which is broken down within the RX 350L and RX 450hL trim levels. 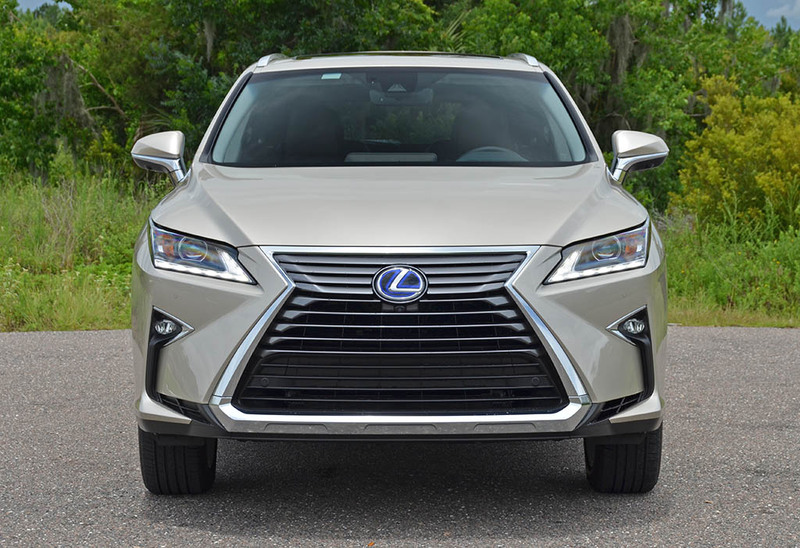 The past week I had the joy of checking out the latest from Lexus in true 3-row crossover form with the RX’s hybrid powertrain, the RX 450hL. 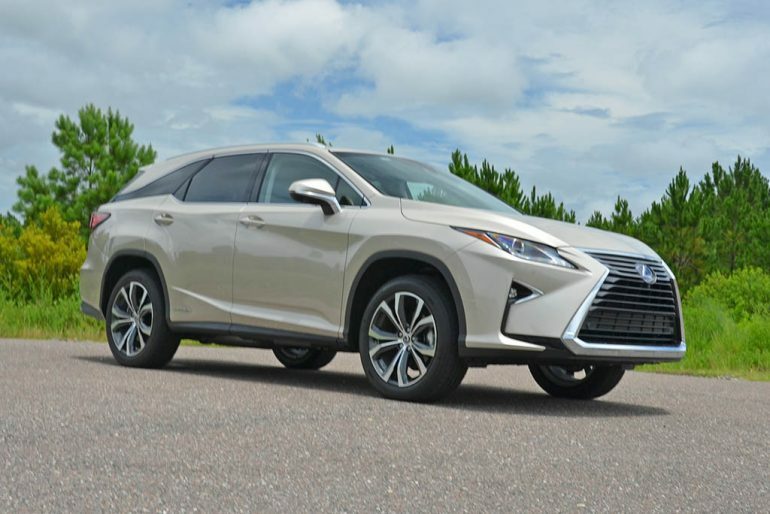 The 2018 Lexus RX 450hL embodies many principals of what Lexus has instilled in its vehicles for many decades taking attributes from what they’ve learned in the Toyota Prius and their famed RX crossover to birth an extended body variation of the hybrid RX. 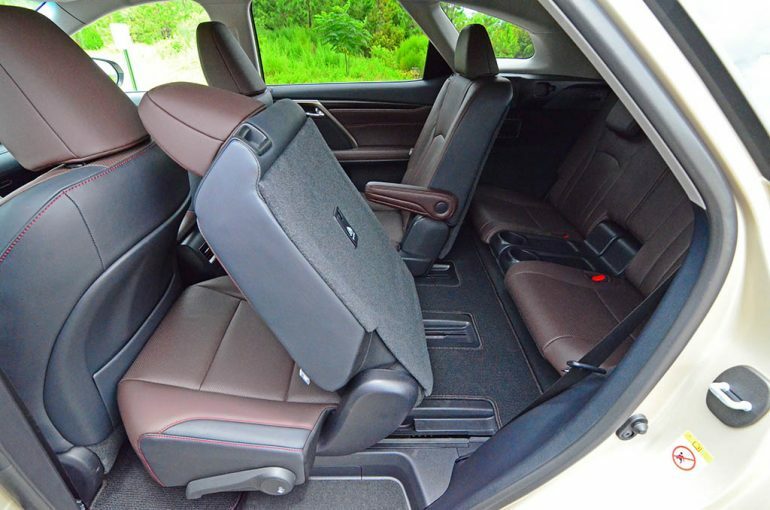 The new RX 450hL literally builds upon the “normal” sized RX hybrid with a longer body structure to “fit” an extra row of seats to accommodate 6-passengers in my test vehicle’s configuration (7-seating configuration in the RX 350L non-hybrid) yet rides on the same standard size RX’s 109.8-inch wheelbase. 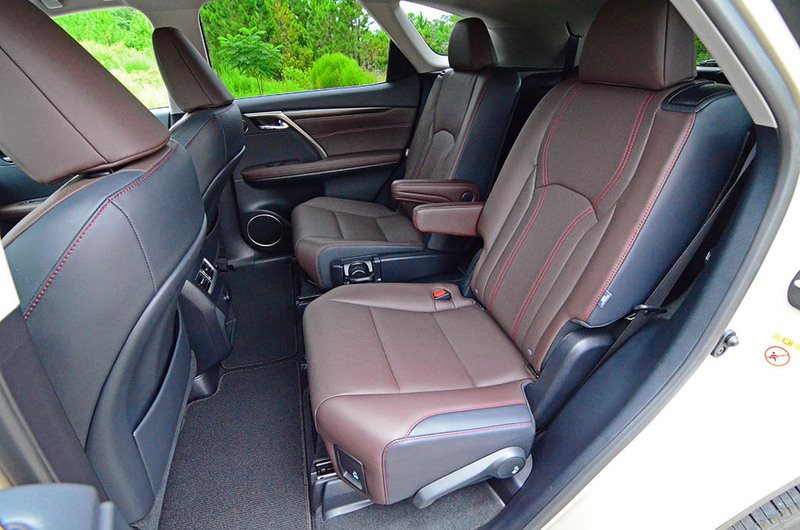 The second-row seating features two captain’s chairs while the third-row is accommodating for two passengers, preferably those with short legs – the second-row seats have ample forward and aft adjustments to permit taller individuals to “fit” in the third row. 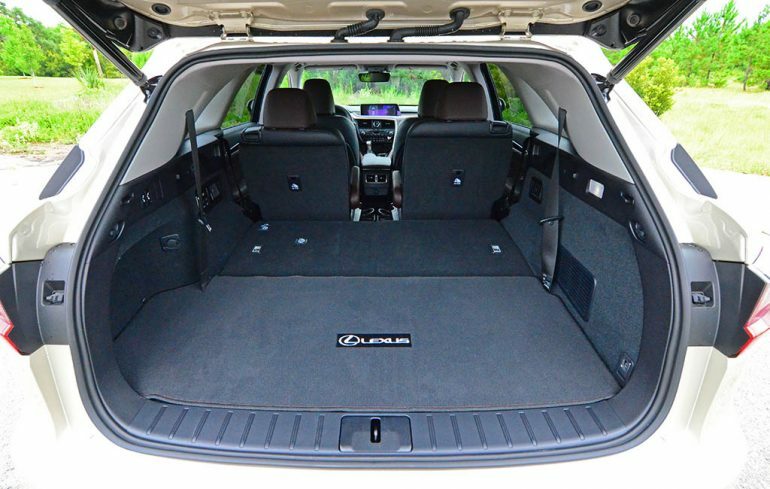 Having about four additional inches in length compared to the regular-sized RX, the RX 450hL adds versatility and additional cargo volume apart from its extra seating. 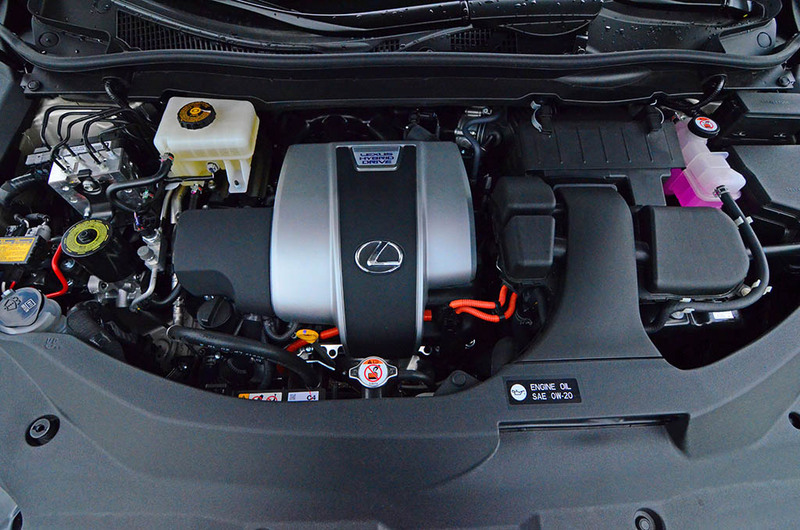 Retaining the proven hybrid powertrain, the 2018 RX 450hL gets the Lexus branded 3.5-liter V6 engine coupled with a total of two electric motors where one acts as motor/generator up front to aid the V6 engine and generate power back to the battery pack and the second is mounted at the rear for the sole powering source for the rear wheels. 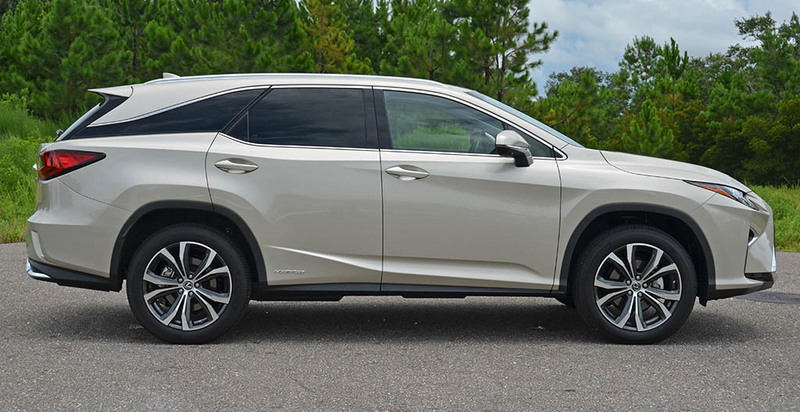 All Lexus RX hybrids get all-wheel drive as it is the totality of its powertrain setup to have the two electric motors and gas engine that all work in synch to produce a total of 308 horsepower and 247 ft-lbs of torque. The hybrid powertrain, as expected, is mostly a seamless act of managing electric and gas-engine power, which is transmitted to the front wheels by the way of a CVT (Continuously Variable Transmission) and a single electric motor to directly power the rear wheels. 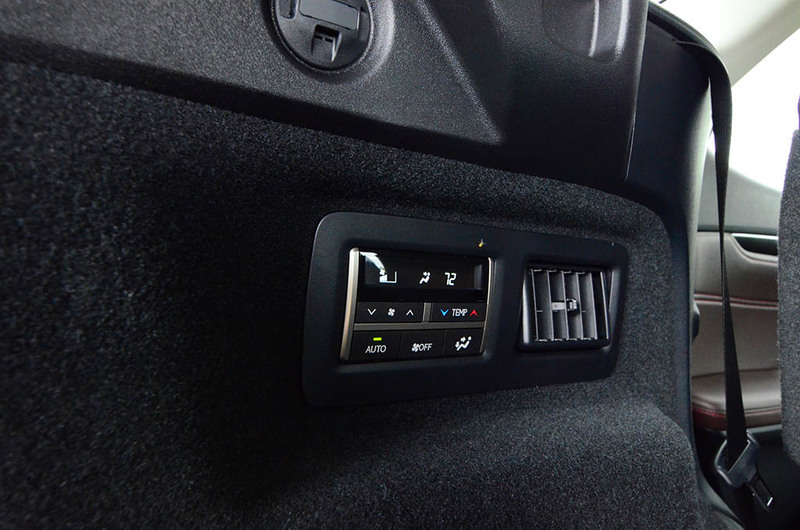 The system reacts quickly to the demands of the driver without any apparent hiccups or delay in delivery of required power. I found that the system at times builds on power somewhat slowly as the CVT takes a second or two to properly adjust to one of its nearly infinite ratios to allow the V6 engine to bury the RPM needle into its redline. In somewhat of a gear ratio step-down, the CVT often reacts to full throttle inputs with subtle rpm lowering ratios. 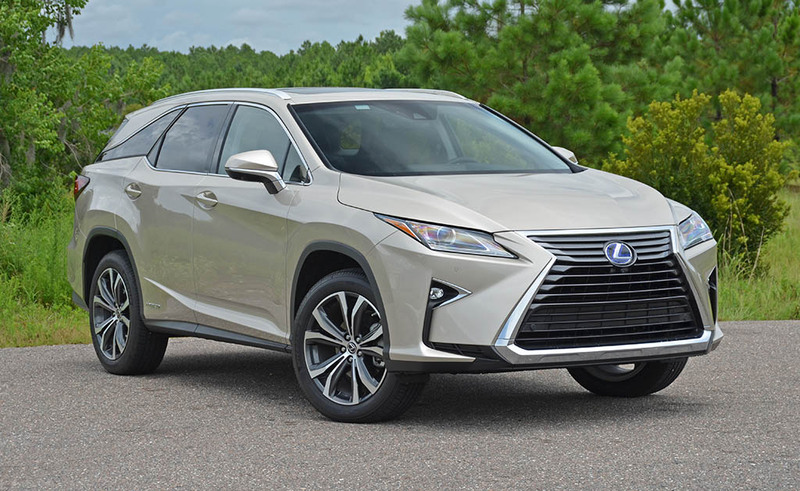 In all, the system works well to get the job done and carry the extra heft of the longer-body RX 450hL with authority reaching 60 mph from a standstill in about 8.1 seconds. The driving character of the RX 450hL is surprisingly very different from any other standard-sized RX in that it drives heavier and appears to pitch and dive upon heavy acceleration or braking more than I remember any other RX doing so. 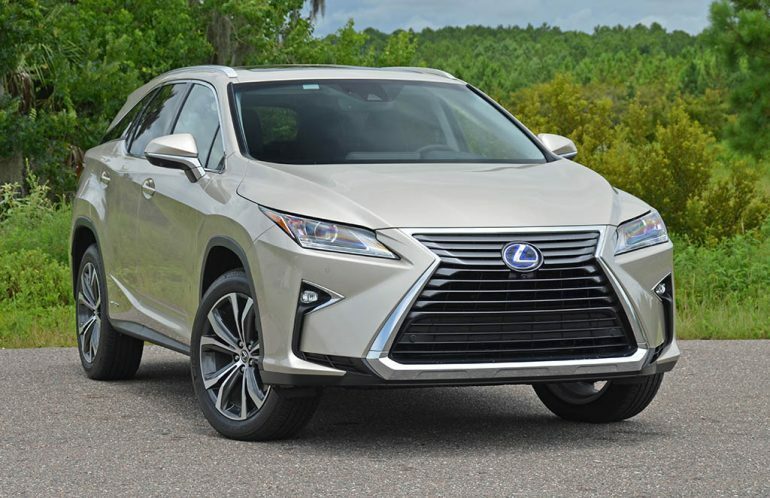 Overall, the RX 450hL feels big and drives just as big, or even larger when its heft is swung around bends and road curves. 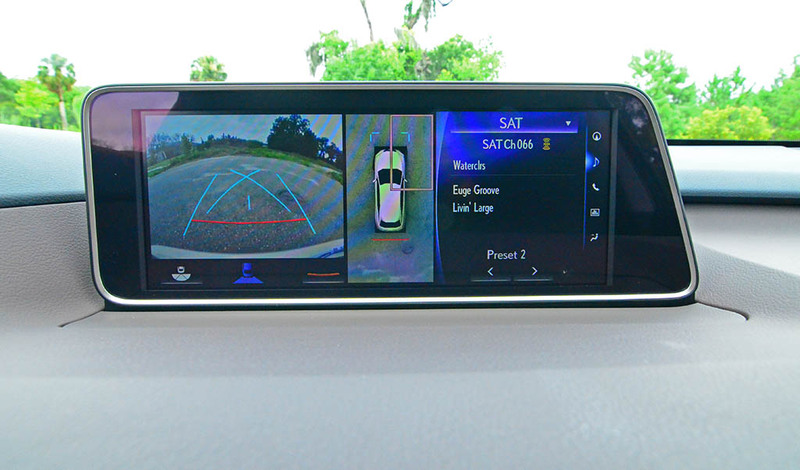 However, the RX 450hL handles itself with a good response from its somewhat spongy suspension that mostly keeps composure of the larger RX as to limit sloppiness. 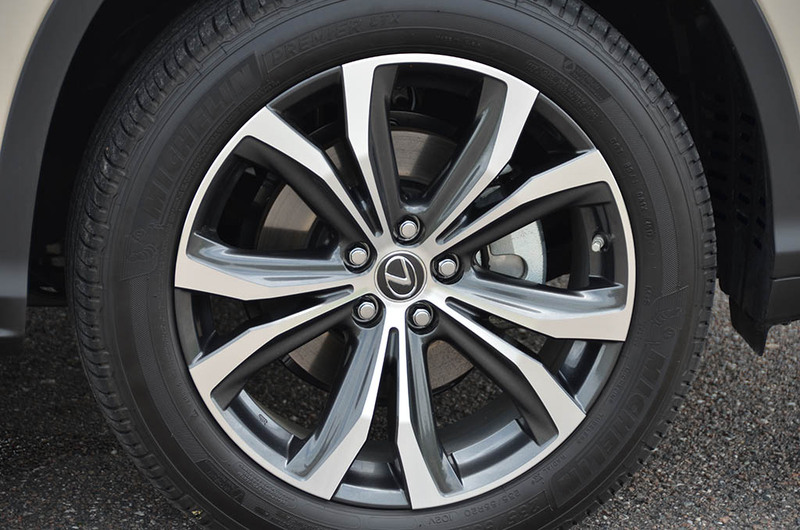 What is appreciated is how well the RX 450hL does to play off a sensation that doesn’t feel like a typical hybrid from years ago – as such the brakes feel natural as does its acceleration performance without fail. Fundamentally, there are no abrupt surprises, and that’s a good thing. As expected, with the proven hybrid powertrain, the Lexus RX 450hL yields consistent mpg numbers with EPA estimates coming in at 29 mpg city, 28 mpg highway, and 29 mpg combined. Such figures are easily attainable as I found in my drive and seldom getting slightly better than the EPA estimates in the slow-moving city traffic. 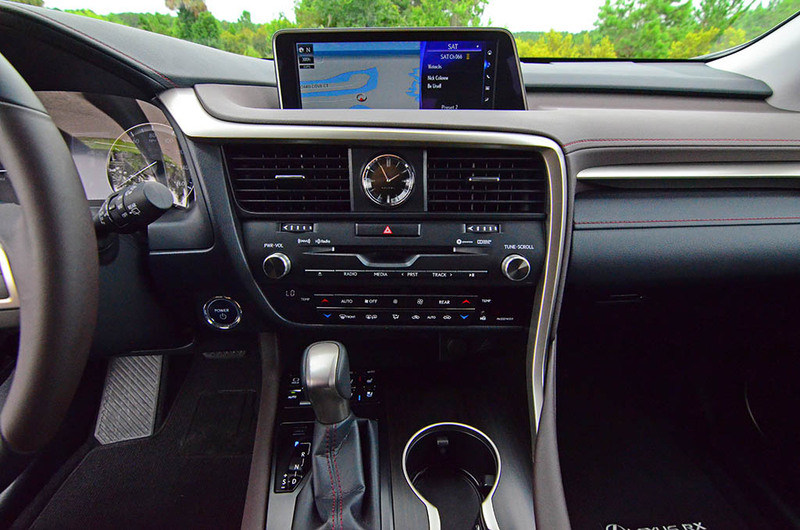 Inside of the new Lexus RX 450hL is much of what you expect in a Lexus vehicle – excellent fit and finish and a bountiful amount of soft-touch surfaces all exuding the proper luxury theme. 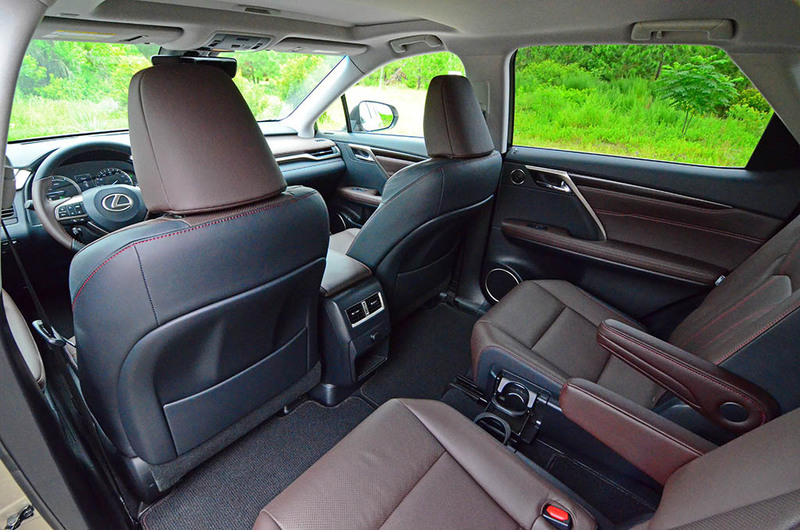 Where the RX 450hL starts to depart from the traditional RX formula is out back with its third row of seats, two seats that are well-enough wide for two adults but can become a bit cramped with the smallish legroom. As explained earlier, the third-row seating leg room is mostly dependent on how the second-row seats are adjusted. 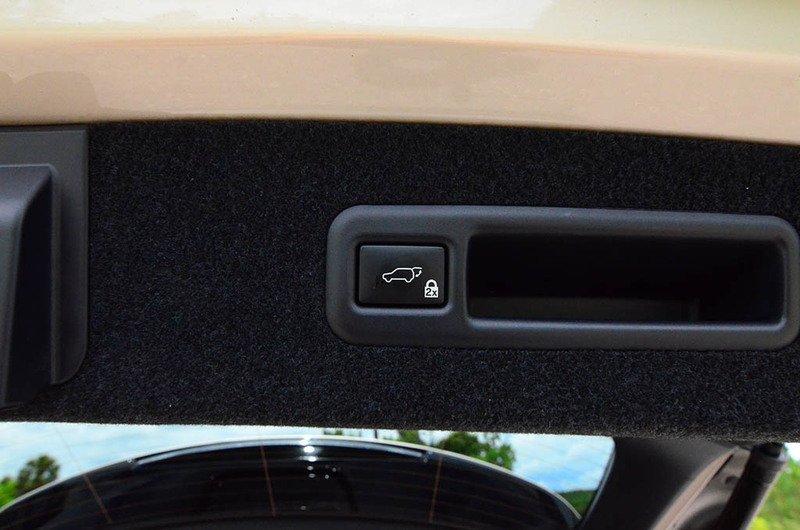 Giving third-row passengers their deserving space, Lexus adds climate controls out back and electric folding seat back buttons accessed through the rear power liftgate door. 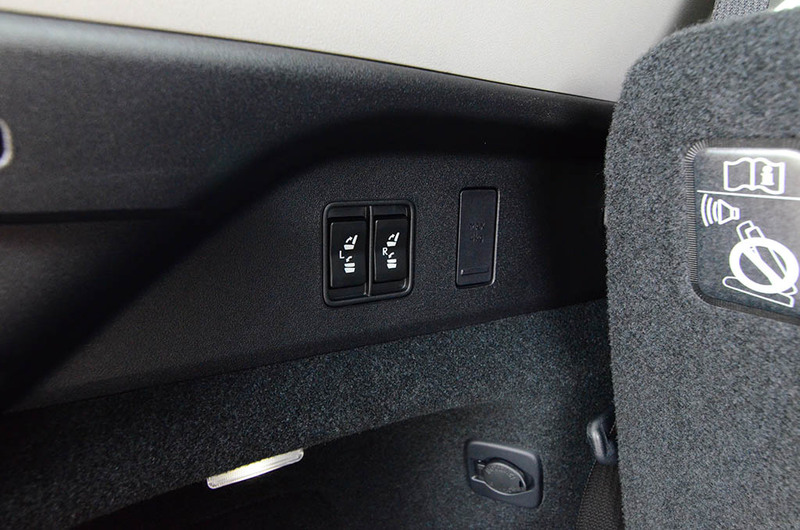 The seats fold flat in a neat lowering act when enacting the power-fold system giving you extra cargo space. 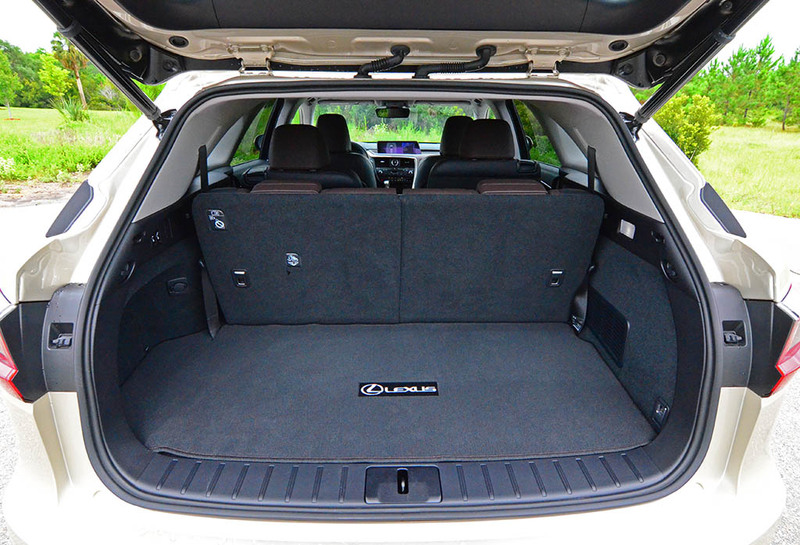 The limitation of the cargo room is somewhat due to the straight roofline. 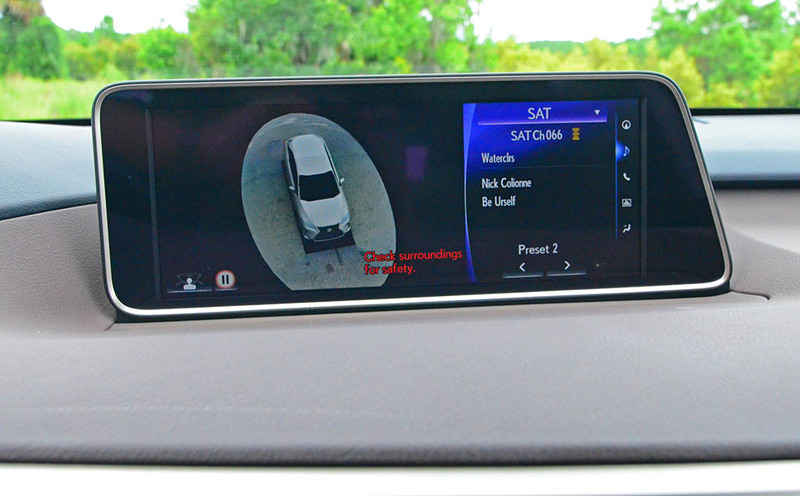 In the realm of technology, Lexus continues to utilize their controversial Remote Touch interface that is an Achilles heel in my opinion as the operation of the system tends to distract the driver. 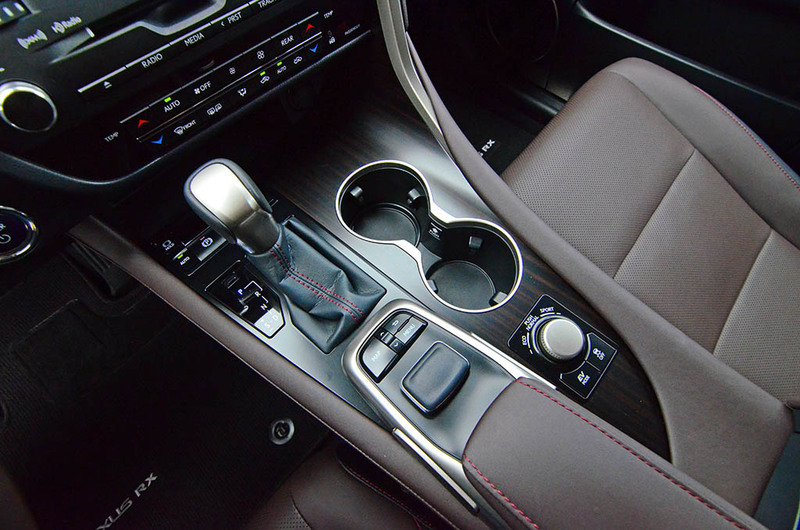 The use of the mouse-like interface can eventually be an accepted acquired taste for some, but it is not as natural as I think Lexus intended it to be. 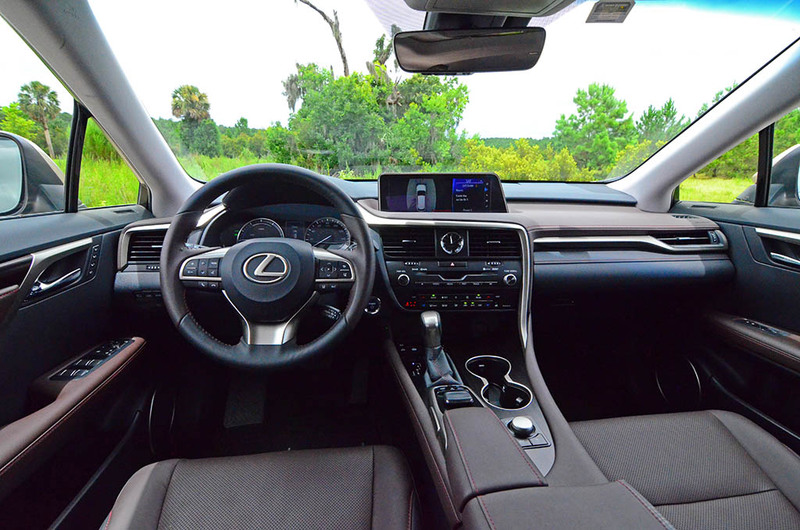 Apple CarPlay and Android Auto are not available but are said to be added onto future Lexus products in the months to come. 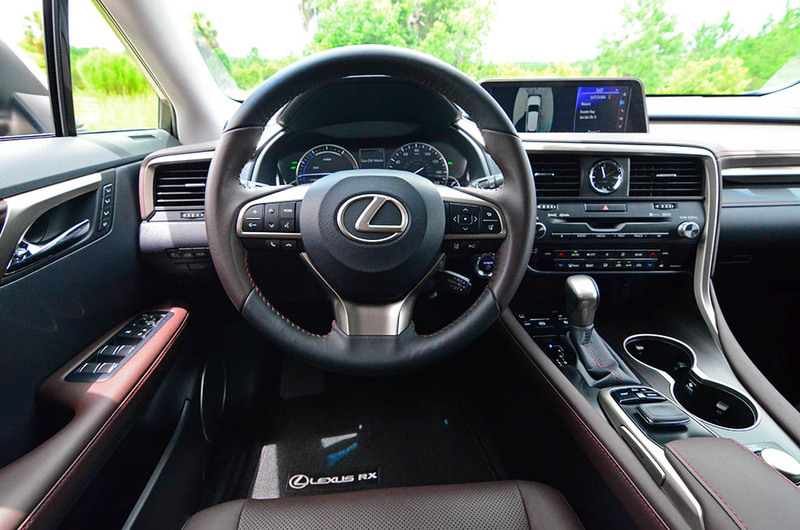 With Lexus offering an extended version of the RX with three rows of seating, the spectrum of competition starts to get quite interesting considering Lexus is the pioneer of Luxury crossovers. It made perfect sense to extend the RX with careful styling in the extension of its body and not to take away from a formula that already works so well in the RX. 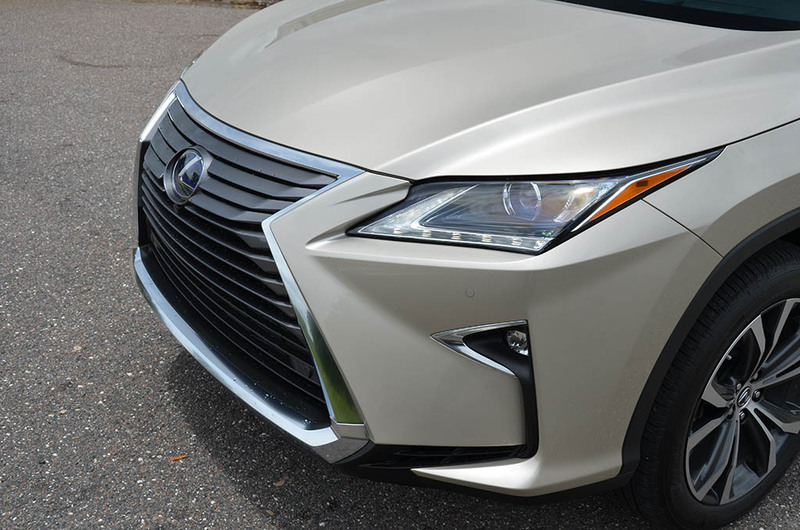 In person, the RX 450hL looks better than in pictures as the eye-trick of the longer body structure tends to appear out of place in imagery. 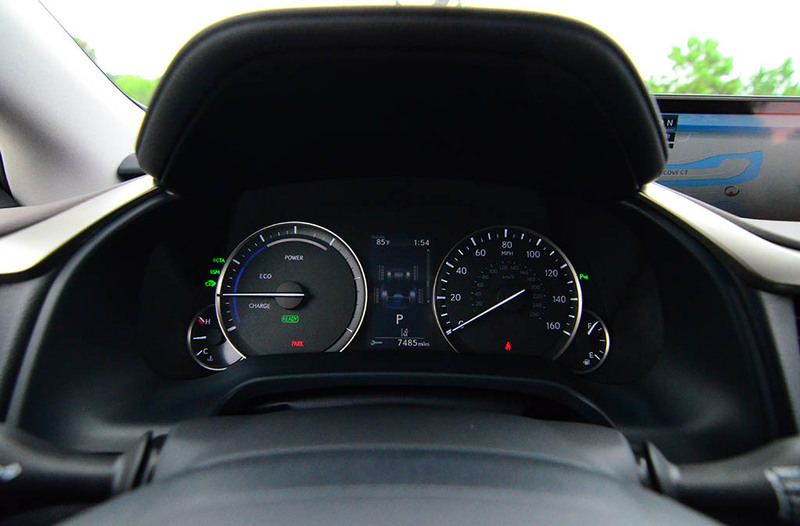 However, after spending a week with the beefy and long Lexus crossover, am assured of Lexus making the right choice in offering such a package that can be loaded up with virtually all desirable luxury amenities and comes standard with a bevy of active safety features expected from an acclaimed luxury automaker like Lexus. The new 2018 Lexus RX 350L starts at a price of 47,670 (RX 350 standard-size$43,470) and the hybrid RX 450hL starts at $50,620. 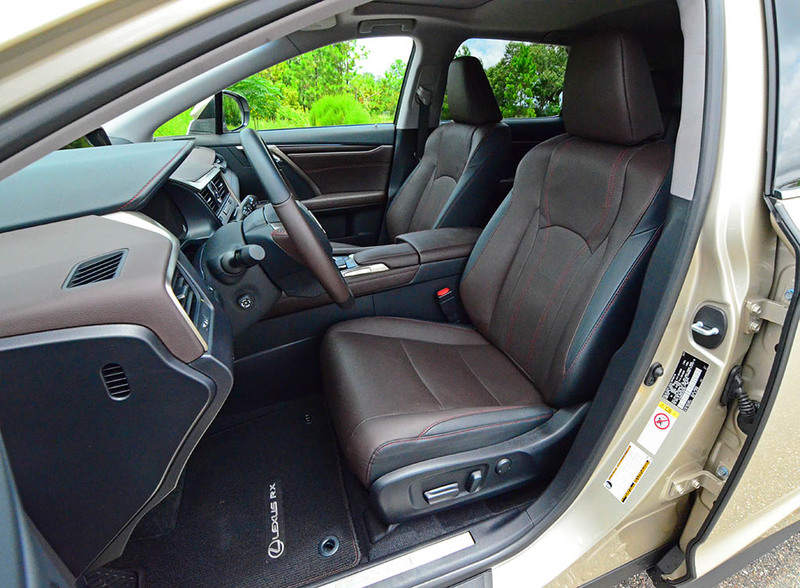 My nicely-equipped and nearly loaded RX 450hL test vehicle has an estimated price of $57,000. Total interior volume: 121.5 cu.ft.